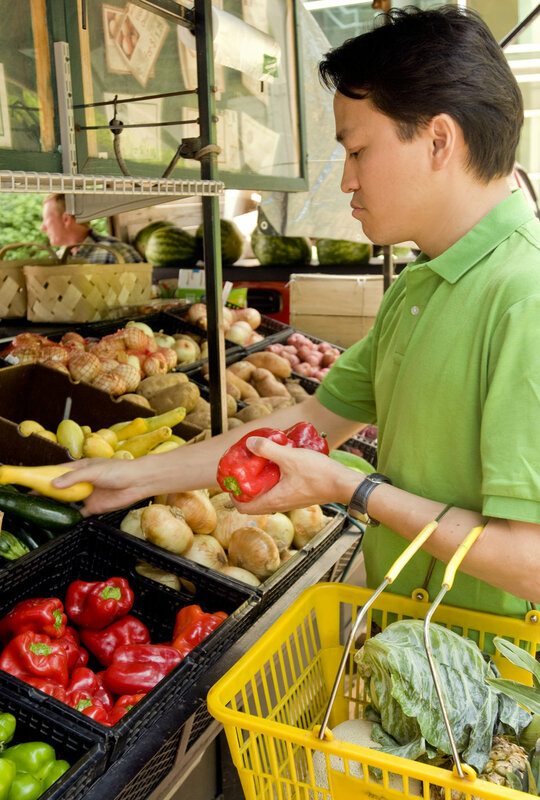 Public Domain Picture: This photograph depicts a man shopping at a mobile produce market, making healthy food choices from an array of fresh fruits and vegetables. This photograph depicts a man shopping at a mobile produce market, making healthy food choices from an array of fresh fruits and vegetables. This photograph depicts a man shopping at a mobile produce market, making healthy food choices from an array of fresh fruits and vegetables. After having made his choices, he had placed his selections into a yellow plastic basket, which he carried by its handles hooked over his left forearm. In this particular view, he was inspecting a bright red bell pepper he held in his left hand, while in his right hand he was picking up a yellow squash.